Asics' marketing pitch: A bold step forward in unsurpassed performance and modern design. Upper: Engineered mesh, no-sew synthetic overlays, plastic heel clip. 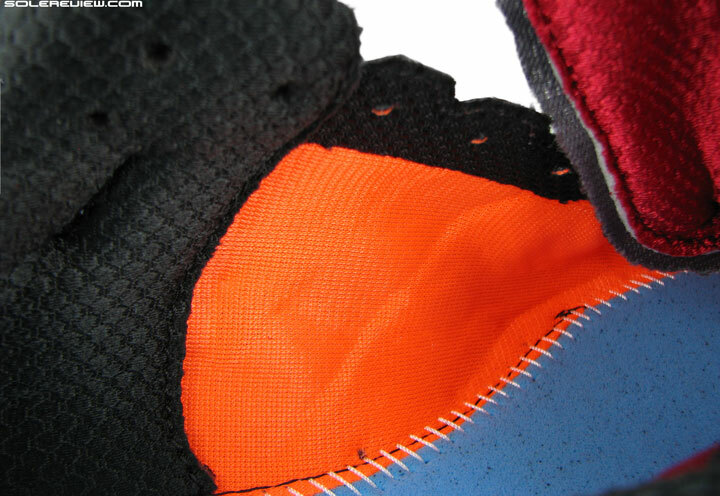 Midsole: Tri-density midsole with forefoot and heel Gel inserts. Plastic midfoot shank, 12 mm heel to toe drop. Is the Kayano 22 worth upgrading from the 21? Solereview should do this more often. Do what exactly? Tell you right away whether a new, ‘upgraded’ model is worth buying over its previous edition. In that spirit, if you’re planning to replace the Kayano 21 with the recently released K-22, our suggestion is that you stock up on the 21 instead. Doing so will result in huge savings, perhaps enough to buy another pair of shoes to add to your rotation. And you’ll end up with a better shoe in the bargain. This year’s Kayano is not really worthy of the ‘upgrade’ moniker. Strange are the ways of Asics. Because, for reasons best known to Asics, the Kayano 22 does something weird to its fit. On top of that, the ride becomes softer, following the footsteps of the marshmallow-ey Nimbus 17. Really, Asics? The Kayano is supposed to be your go-to ‘stability’ shoe, not Nimbus 17’s sidekick. Sure, the increased softness makes the Kayano 22 a great shoe for walking around in town, or standing in them all day. But then, the Kayano happens to be a running shoe. And we thought that the Kayano 21 was soft. Once you actually start running in the Kayano 22, you begin to realize how sorted and well put together the Kayano 21 was. Not only does the softened ride leech the Kayano 22 of its overall stability, but there are a couple of other design changes which causes the heel to feel lopsided. And there’s the new fit, which like the midsole, feels nice when you’re not running in them. Guess what happens when you do start running in them? Yeah, right. What has caused the Kayano 22 to change so drastically? The upper design has been de-cluttered by the use of fused overlays like this one, though some stitched-on remnants stay. The Kayano 22 now switches to engineered mesh, like many others. Use of internal laminates (in ruby red) prop up the mesh without adding seams. Heavy duty areas such as the heel-lock eyelet stay stitched-on. 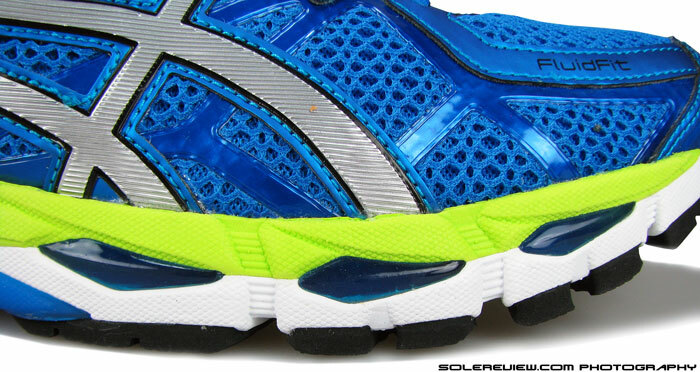 Before anything else, Kayano regulars will notice the strangeness of the upper fit. On paper, a lot appear like improvements. The fore and midfoot is pretty much no-sew now, with all those stitched-over components of the K-21 being replaced by fused overlays. A lot of the visual clutter has been cleaned up, like the forefoot side webbing of the K-21. 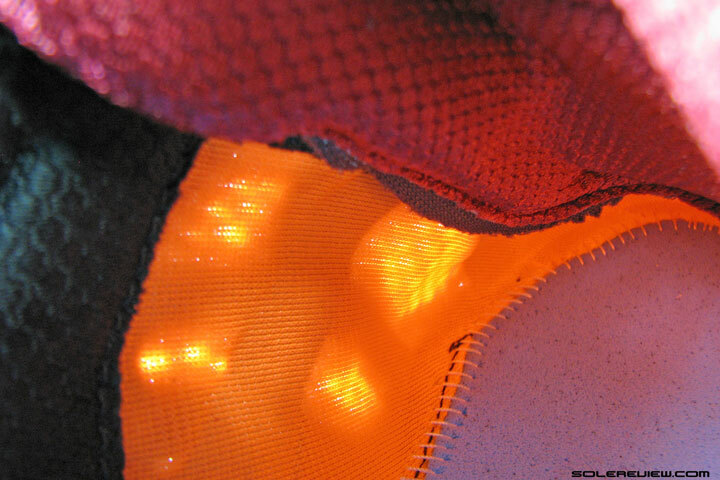 The K-21’s spacer mesh has been swapped with a two-layered engineered mesh. You know, the now ubiquitous mesh design with open vents in certain areas and closely knit areas in another? A pleasant change from the K21’s busy interiors. The insides feel much smoother than before. The lateral inner has taped seams, but does not irritate. 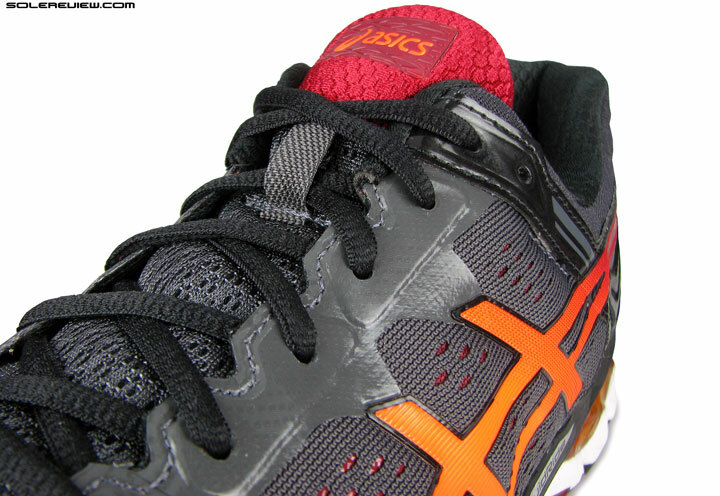 Asics has used a very thin fabric tape which sits flush with the lining. 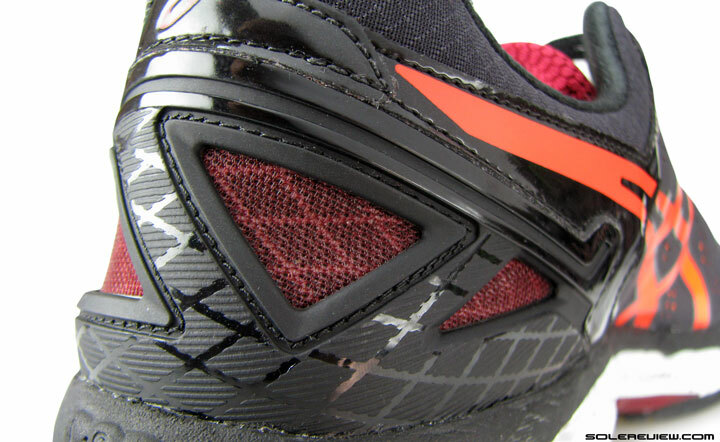 Same tongue lining from the Kayano 21. Unchanged design too. The collar fabric and padding levels stay same. 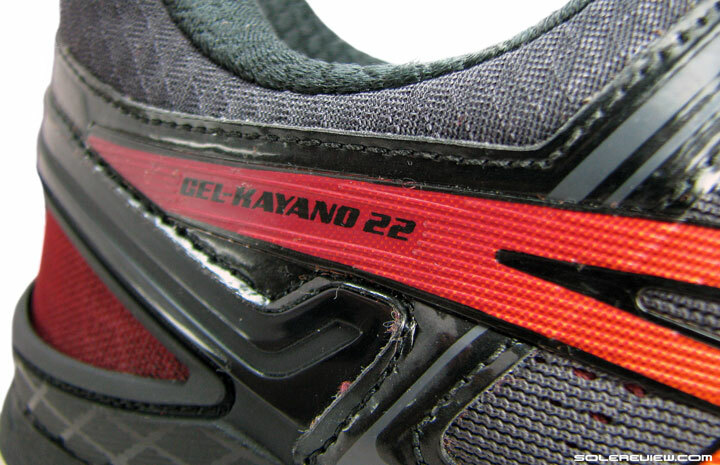 The insides of the Kayano 22 are much smoother due to the near-complete lack of stitched seams outside. The interior feels a nice place when you slide your foot into the shoe for the first time, and the tongue retains its soft lining material from the K-21. The upper heel stays true to last year’s design, sticking to the same collar lining and padding which feels snug yet pleasantly comfortable. 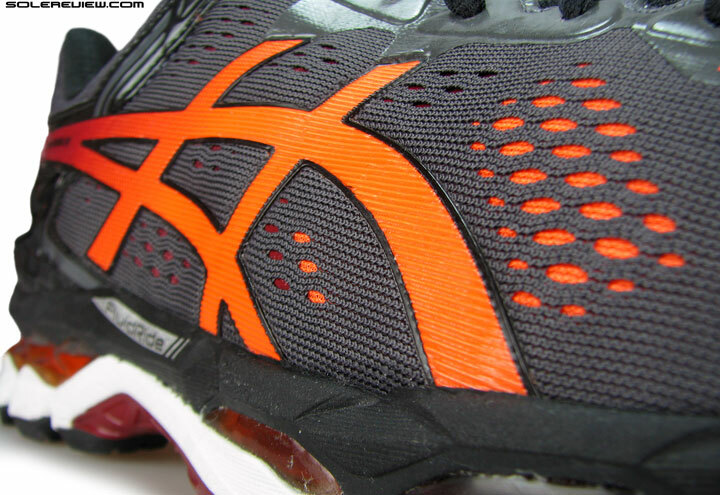 There was no issue with heel grip on the Kayano 21, and that holds true for the 22 as well. Similar looking, yet redesigned plastic heel counter. The red mesh windows are completely reflective; this wasn’t so on the Kayano 21. …and this is how the windows look medially. 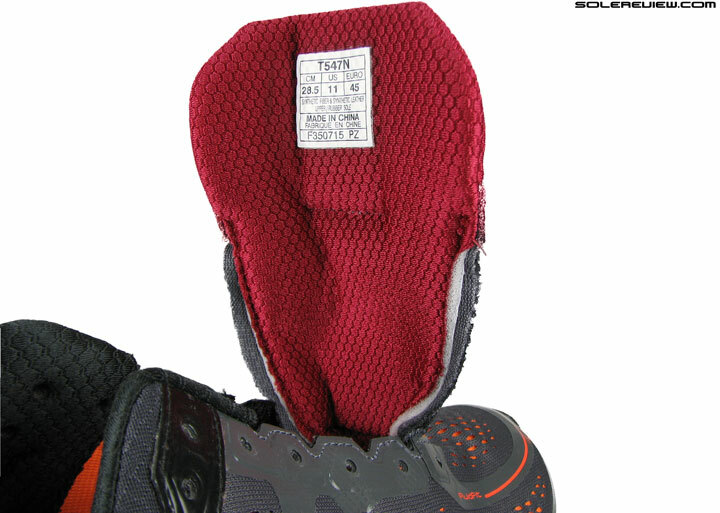 On the outside, the plastic heel counter comes with a few changes. There’s a lot of reflectivity spanning the open mesh windows, and on the lateral (outer) side, the plastic piece extends a little further towards midfoot. 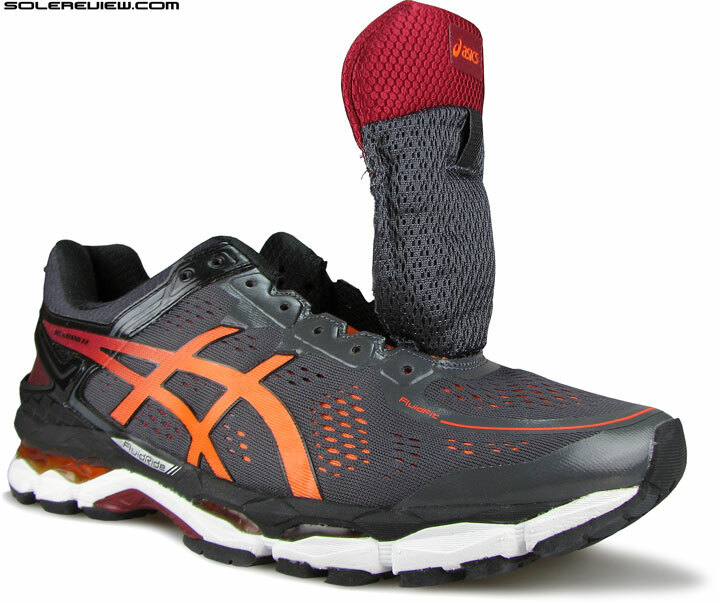 Overall, the heel feels identical to the Kayano 21’s design in fit and feel. With all this apparent goodness, what could possibly go wrong on the upper? Yup. That’s how huge the difference is, toe to toe. The Kayano 22 does a Nike Pegasus 31, and squeezes down on the toe. As it turns out, a couple of things will have most people scampering back to the safety of the Kayano 21. 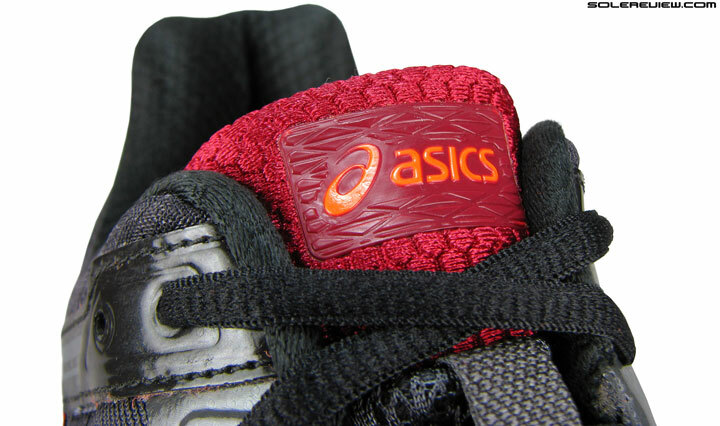 The first part pertains to the Kayano 22’s toe-box. Not only is it noticeably shallower than the K-21, it takes on a more pointy profile. Here’s how comparing the business ends of both the Kayano versions looks like. The difference is telling, isn’t it? A shallower toe-box is the result of this inexplicable update. 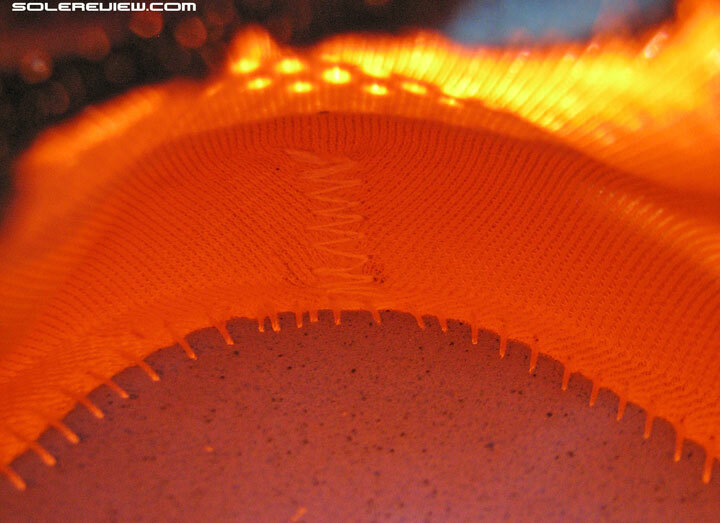 The big toe tends to push through the upper mesh from the inside. You will immediately miss the accommodating nature of the Kayano 21’s toe-box fit. The newly designed canopy of the K-22 not only hems in the big toe from the top, but also on its medial side – a result of the pointier toe box. Sounds crazy, but true. Not only is the insole 5 mm longer; the entire shoe happens to be so. And here’s where things take a turn for the weird. 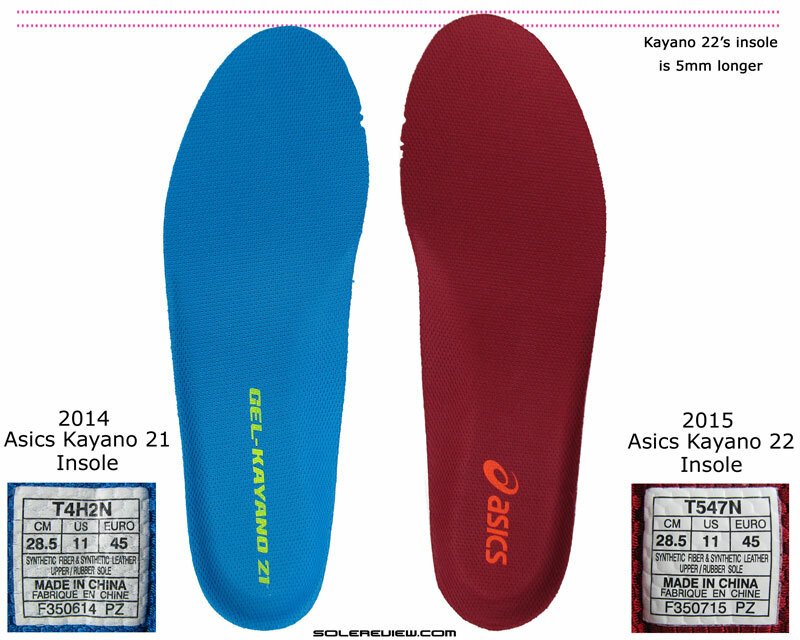 For the same US11 size, the Kayano 22’s insole/footbed is 5 mm longer than the 21. And the strangest part is that increase in length does not eat into the upper volume; that is purely the doing of the shallow toe-box. Instead, Asics makes the entire shoe 5 mm longer than the Kayano 21 when measured from the heel outsole edge to start of the midsole right under the tip. That explains the heavier weight of the K22, despite all the no-sew deal. The new Kayano is 369 grams or 13 ounces, nearly 20 grams over the Kayano 21. Going half-upsize isn’t the perfect solution, which brings us to the second issue with the Kayano 22’s upper. Except for the toe-box, the Kayano 22’s fit is actually very roomy versus the Kayano 21. There are three factors which creates additional space inside the new model. 1) Lacing is pushed back, opening more forefoot room 2) Closer lacing = lower top down pressure 3) Thinner tongue frees up space too. 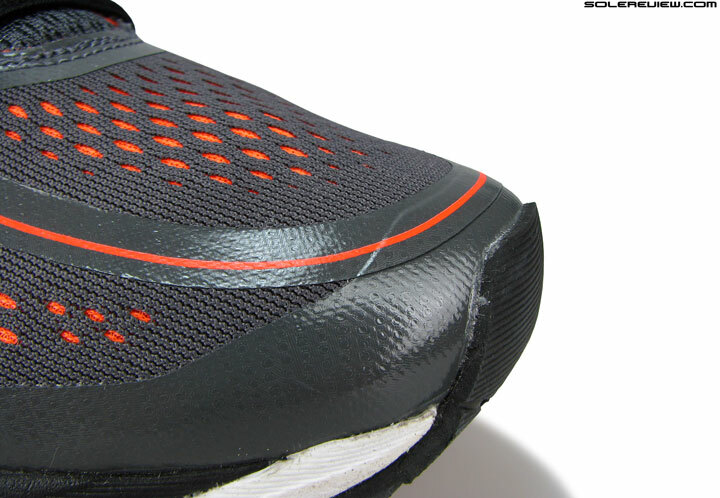 1) More width available due to lack of welded overlays 2) More relaxed midfoot fit 3) No change in heel fit, but the outside has greater reflectivity. On the forefoot, the lacing is pushed back by 5 mm. This eases off the pressure over the forefoot. 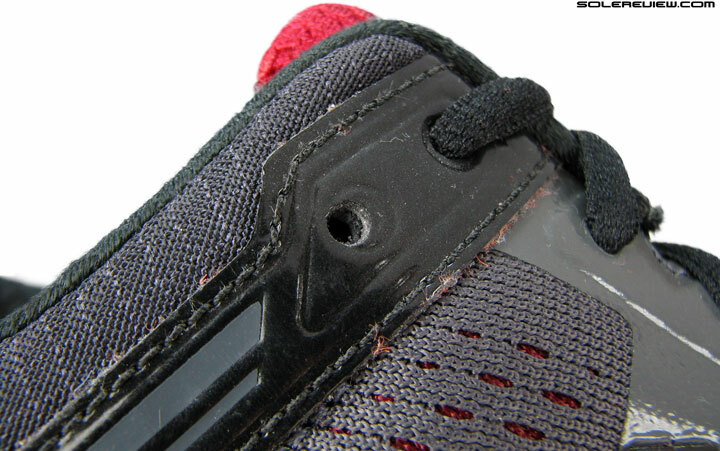 The urethane welds or ‘webbing’ which used to earlier hug either sides of the Kayano 21’s forefoot – that too, is gone. So put these two together, and the unsurprisingly result is a wider fitting forefoot. Lacing is closer (decreased distance between opposing eyelets), which lessens top-down pressure. A thinner tongue eases off on the level of midfoot lockdown. The third factor involves the combined effect of the redesigned lacing and tongue. The gap lacing is set narrower, which means lower top down pressure over the foot. And the tongue is relatively skinny compared to the thickly quilted type on the K-21. These are means to achieving a more relaxed midfoot fit quality, and that’s how the Kayano 22 ends up feeling. Smooth but sloppy is how one can best describe Kayano 22’s fit. The reassuringly midfoot lockdown experienced on the Kayano 22 is a thing of the past. Instead of keeping the foot secured over the midsole, all that stands out is the shallow toe-box, and isolated lacing pressure under where you tie your laces. And perchance, should you happen to run barefoot in the Kayano 21, the upper will feel downright baggy relative to the K-21. A thinner tongue, and lower lacing pressure. So it slides sideways more than what the Kayano 21 does. 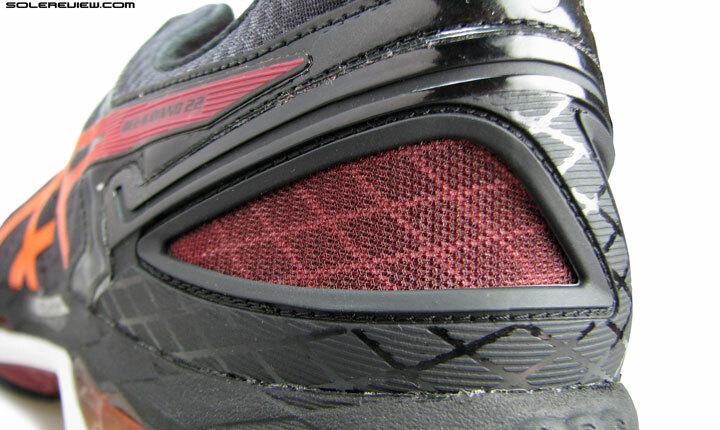 The tongue also tends to slide more than the Kayano 21, as there isn’t enough padding to keep it in place. But that’s a minor irritant, and not a deal breaker. What one really misses is the confidence inspiring midfoot grip of the Kayano 21. 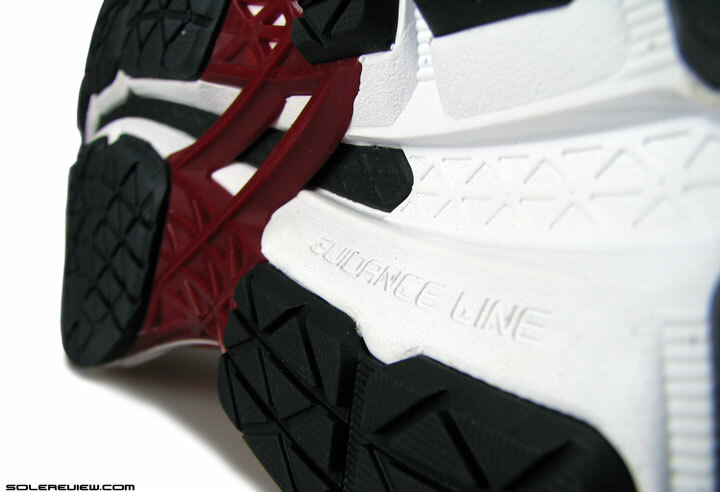 For a stability shoe, a supportive midsole should be only half the story. What brings it home is an upper which keeps the foot secured over the midsole, and it is here where the Kayano 22 comes up short. And what of the other half of the story, the ride behavior? The new Kayano is a softer Kayano, but there’s more than meets the eye. 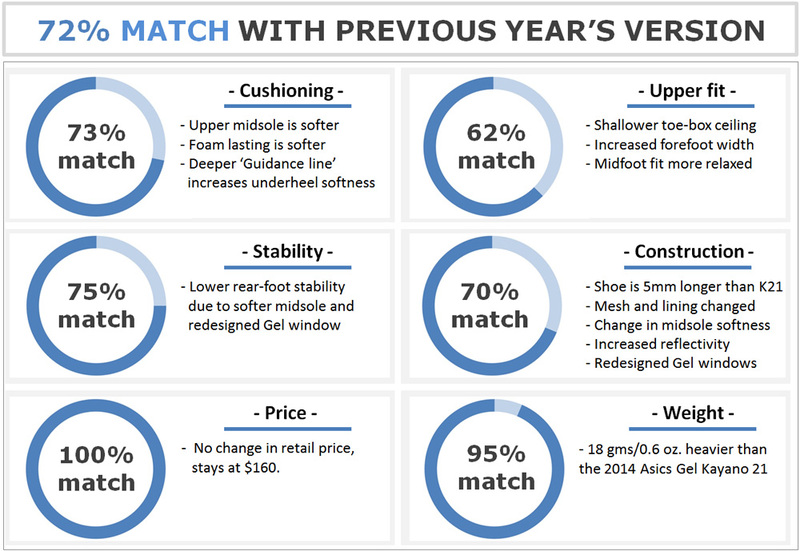 The heel feels less stable than the K-21, and the transition quality is found wanting in a few aspects. The foam lasting below the insole has become much softer on the Kayano 22. First, let’s quickly go over the summary of changes. Or more specifically, updates on the Kayano 22 which makes the ride softer than the 21. 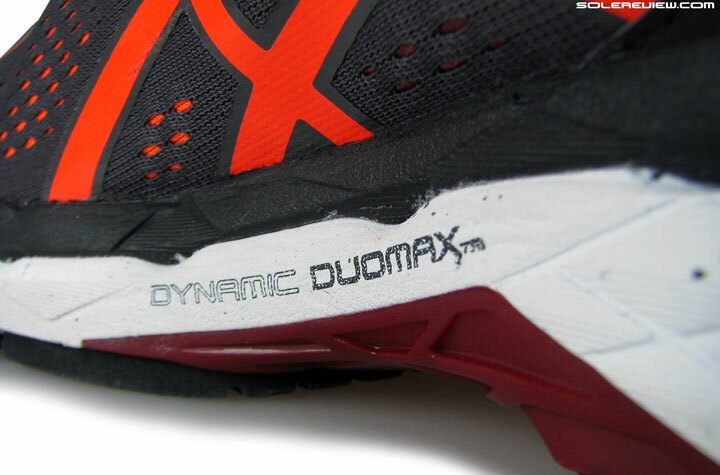 Despite its increased size, the insole’s foam firmness stay unchanged. What has changed though, is the foam lasting below it. 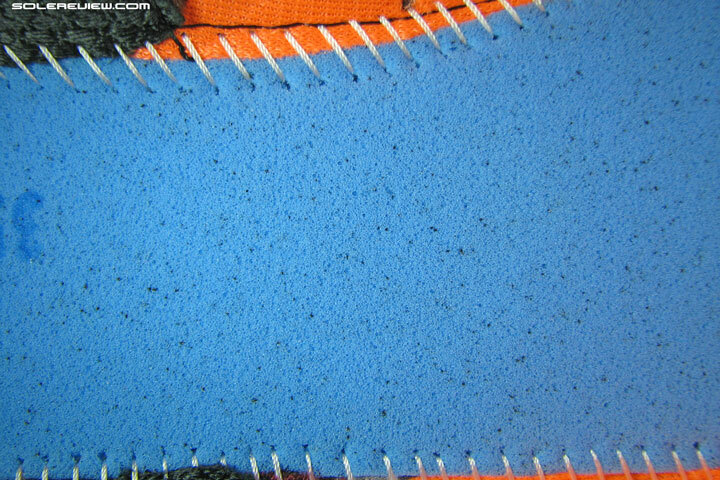 The compression molded, EVA foam lasting on the Kayano 21 (top) has been swapped with a squishy-soft, blown foam sheet on the Kayano 22 (bottom). Exactly like how the uber soft Nimbus 17 did it, the Kayano 22 swaps the compression molded EVA sheet with a more porous foam. This instantly increases the level of softness under the foot; a change which is fairly noticeable even during your first few steps in the 22. 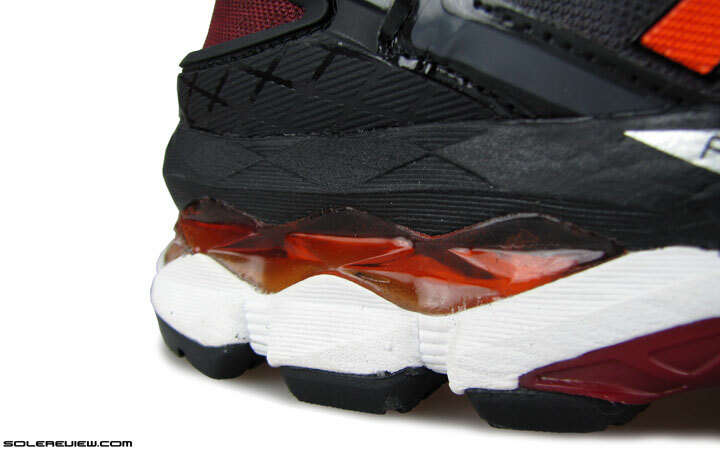 The forefoot has Gel windows, which are functionally useless. 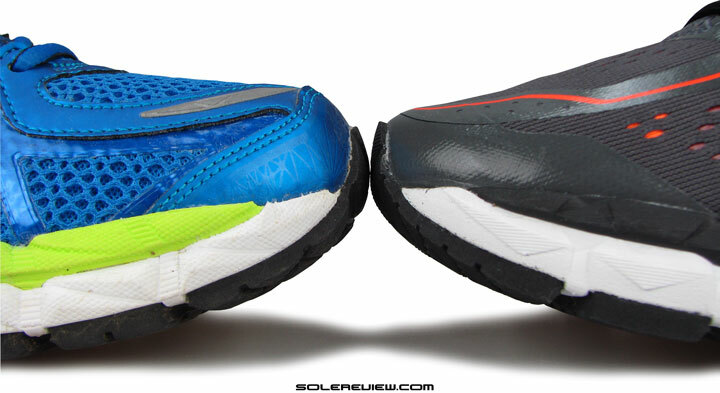 The Gel windows on the heel affects footstrike patterns, as we’ll see in a while. 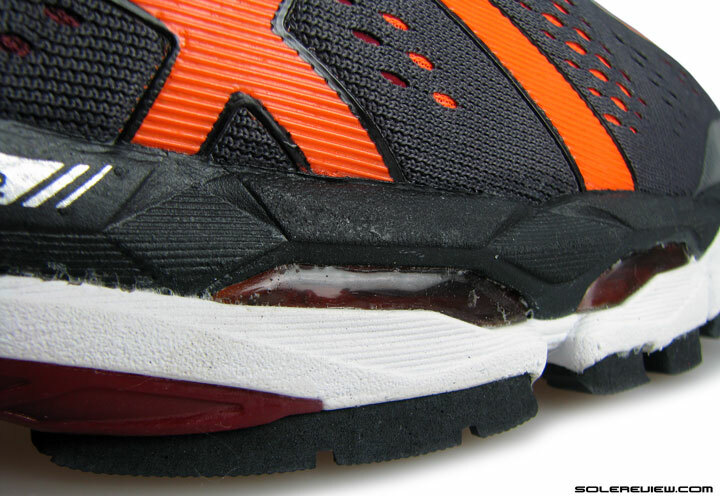 The firmer medial post (the area with speckles) of the Kayano 21. So this midsole has three foam densities – the soft black top, the medium softness lateral side, and the firmer medial wedge pictured above. 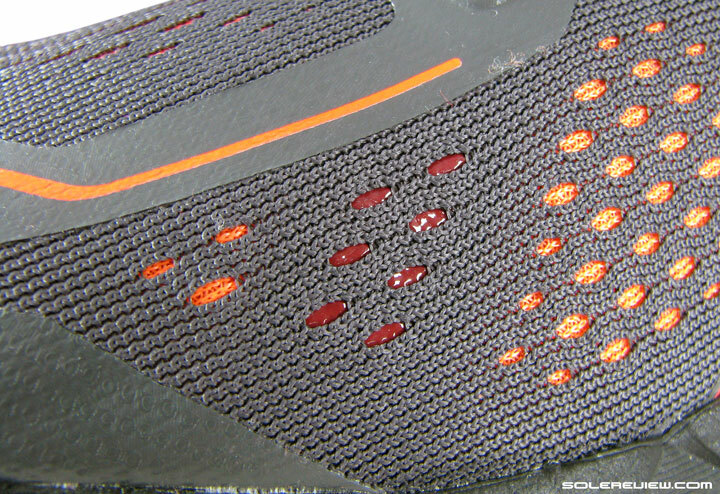 The midsole is quad density if you count the Gel pads. The Kayano 21 came with a three-tiered midsole, and so does the Kayano 22. 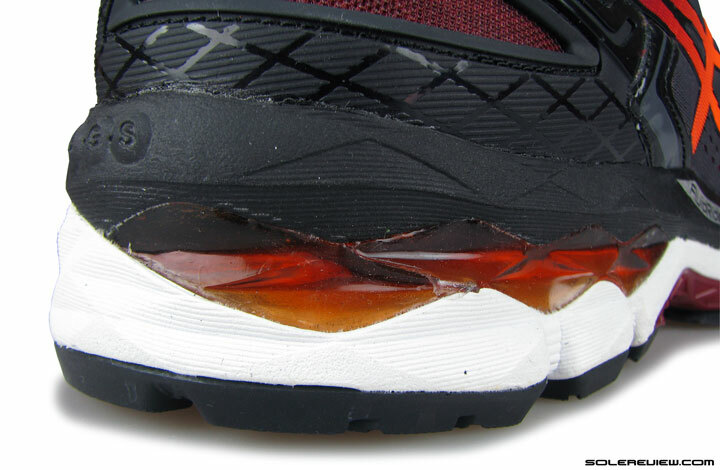 There’s the top EVA layer directly beneath the upper, followed by the visible Gel windows and the lower midsole. 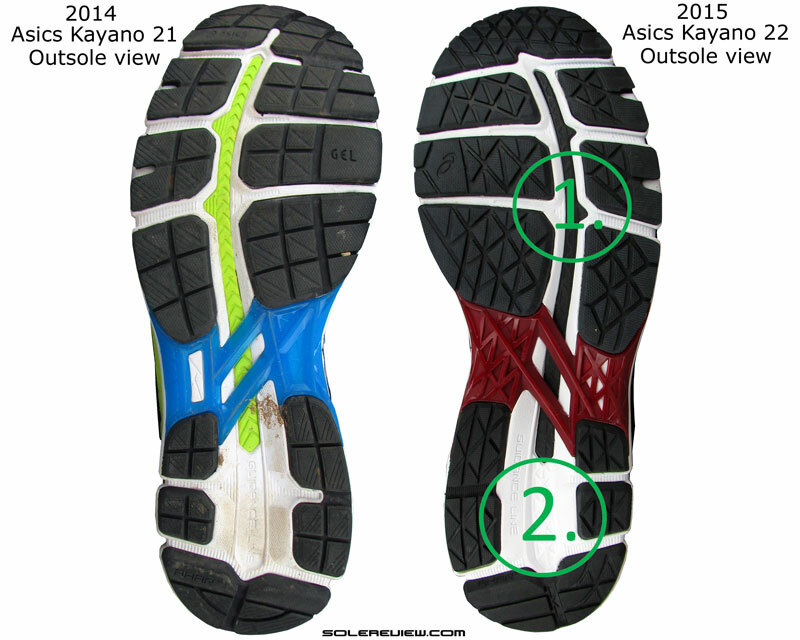 And know you must – that for most Asics shoes, the midsole cushioning comes from the foam and not the Gel pads. A lot the Gel is restricted to the sides as a visual tool, and very little of that tech actually pads the underside of your foot.. 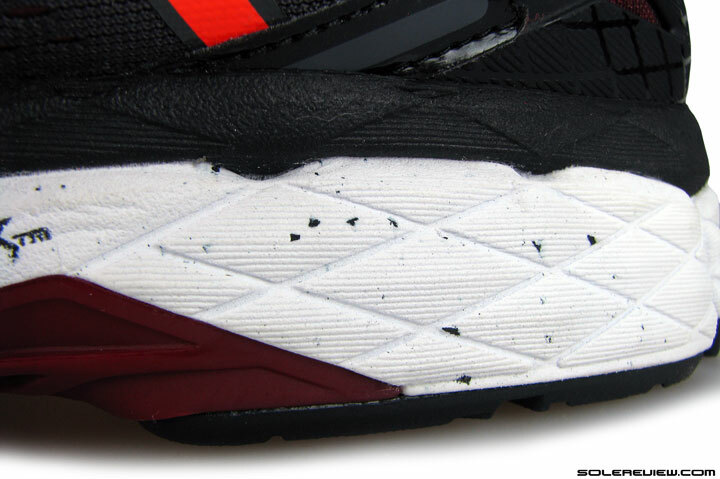 The upper midsole (pictured here in black) gets softer too. 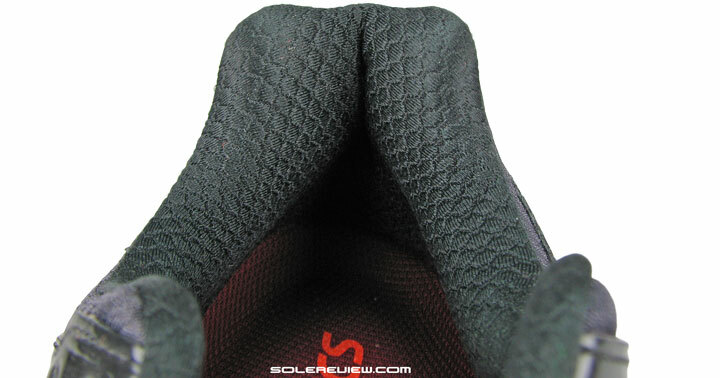 The lower midsole has not changed in softness, nor have the Gel pads. The upper midsole isn’t the same, however. The foam is much softer than the Kayano 21’s upper midsole – just to make sure everyone knows what we’re talking about, it is the sheet of black foam on the K-22 and lime green on the K-21. 1) Softer midsole due to changed foam lasting and upper midsole. The latter also forms the guidance groove underlay 2) Heel is softer due to material change and deeper guidance groove. 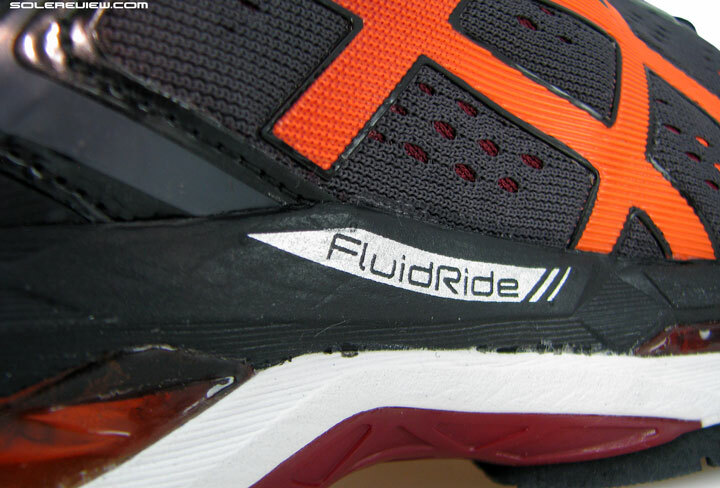 While the softer lasting and upper midsole makes the overall ride softer from heel to toe, there’s a third factor involved. If you turn the shoe over, you’ll be greeted by the familiar sight of Asics’s ‘guidance line’ – a channel which cuts along the length of the outsole. At one point in time, this was supposed to improve transition. But with all that softness going around, the ‘Guidance line’ design might require a reset. The guidance groove is deeper on the Kayano 22 versus the 21. This increases splay, and hence the cushioning softness. 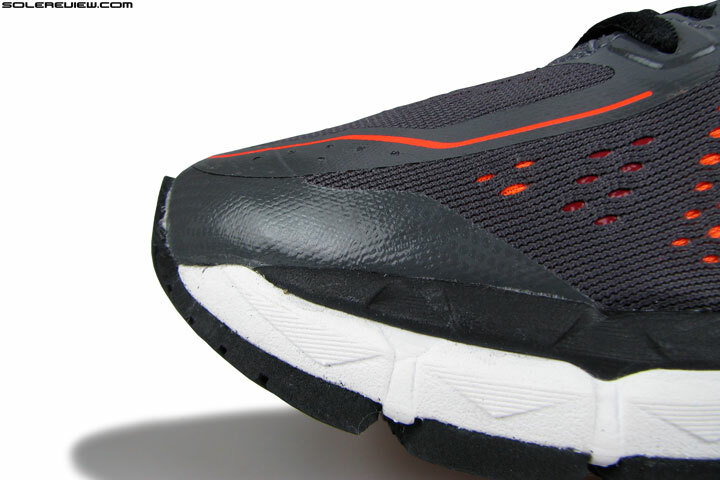 Under the Kayano 22’s heel, this groove is now deeper compared to the 21. 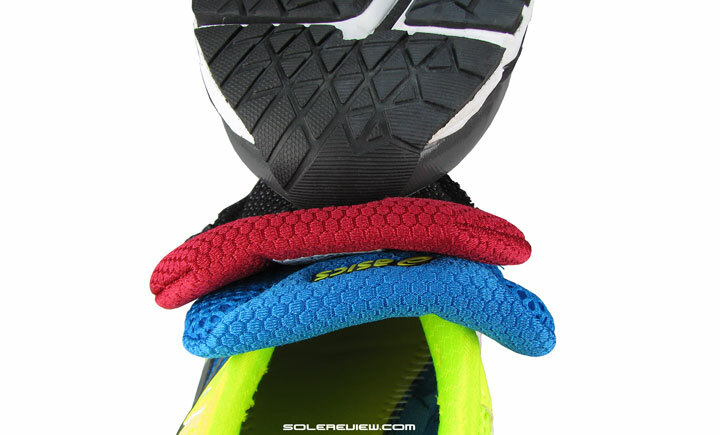 It means that every time you load weight on the heel, there’s increased midsole travel or downwards compression. This adds to the overall softness too. The extra dose of softness has a slightly negative effect on stability, but it’s a rather innocuous looking update which plays a larger role. See the heel Gel windows with angular carving? 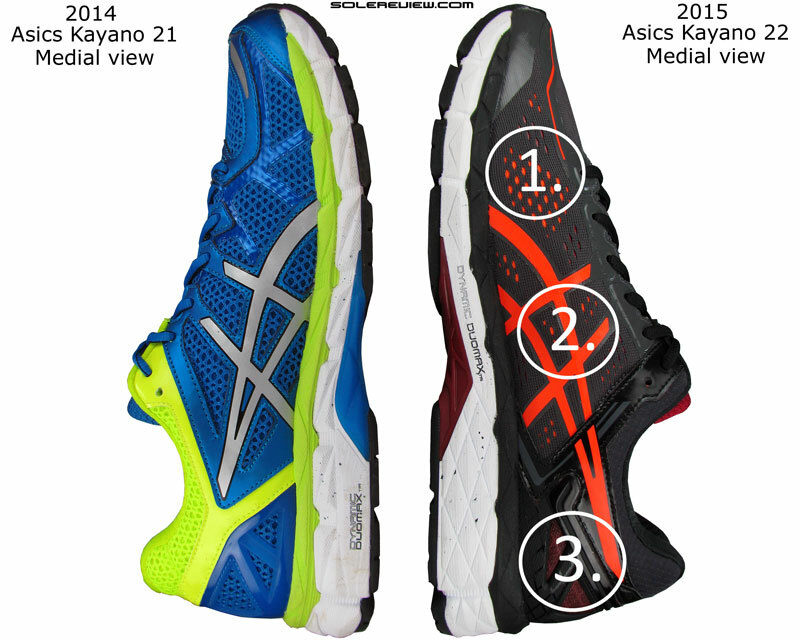 Compared to the Kayano 21, there is a minor design change which affects rear-foot stability. The heel Gel windows come with an inwards cut running along its centerline. Good for aesthetics, bad for stability. There’s a huge contrast in softness levels between medial (pictured) and lateral (gel window) side, which negatively impacts stability. Most motion control shoes maintain a good balance – even the Kayano 21 did. 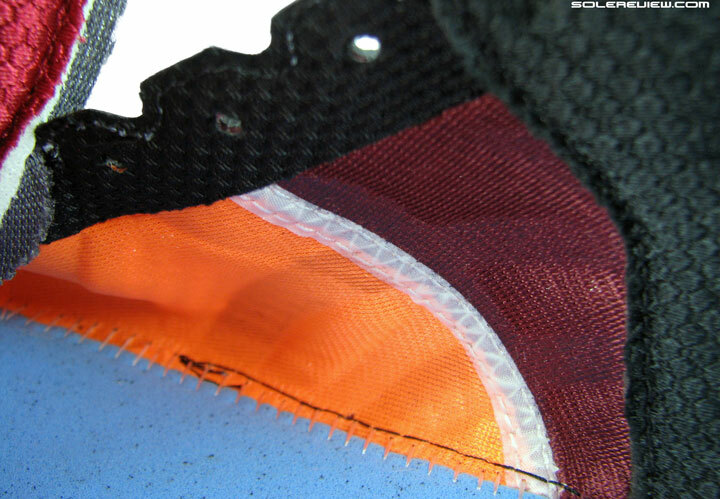 There is also a difference in how the midsole layers are stacked, and this affects footstrike behavior. If you look closely, the center of the Gel pads have a sharp inwards cut. So when you rear-foot strike, the midsole tends to compress much more on the lateral(Gel side) than the inner side, which is made of a firmer foam. This ends up in the heel feeling lopsided with a noticeable outer side lean or bias. You get the sense that the shoe isn’t tracking straight, and none of this was experienced on the Kayano 21. But wait, one might say. 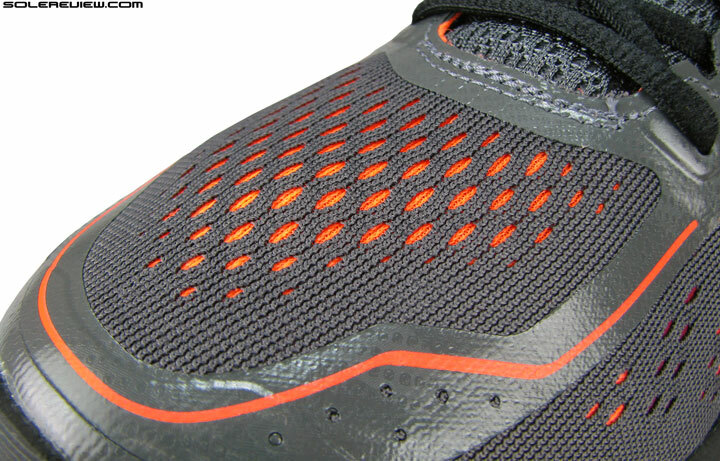 Isn’t that how these Kayano type of motion control shoes are supposed to be, soft on the outside, firmer on the inside? Only partially. To begin with, every running shoe should be fundamentally supportive, and any enhancement should be a sub-set of that. In case of the Kayano 22, the motion control behavior negatively impacts stability, which is a big no. Reminds us of the Nike Structure 17, which was another such shoe. Nike said it was stable, but it was actually not. The sharp stacking of soft and firm foams achieved the exact opposite. The Kayano 22’s lack of stability stands out in contrast to even the Kayano 21, which was definitely more supportive. Other shoes in this category such as the Adidas Sequence 8, Brooks Adrenaline GTS, Mizuno Wave Inspire, NB 1260, Nike Structure and Odyssey or the Saucony Hurricane – none of them feel unstable. So the Kayano 22’s behavior is the exception, and not the norm. So these are the options you should try instead of the Kayano 22. If you’re a Asics person, then get the Kayano 21 for cheap. If the snug forefoot of the 21 poses a problem, then see if you can get a 2E. Transition quality also suffers on the Kayano 22. The softer midsole and deeper groove saps the efficiency of transitions, resulting in a lazier experience. Asics’s Guidance line worked very well when their shoes were firm, and when the Kayano was a stability shoe in its truest sense. Remember the Kayano 17, 18? Combining the guidance channel with a very soft middle doesn’t exactly produce the best results. We also have this nagging feeling that the Kayano 22’s elongated outsole base also is to blame. 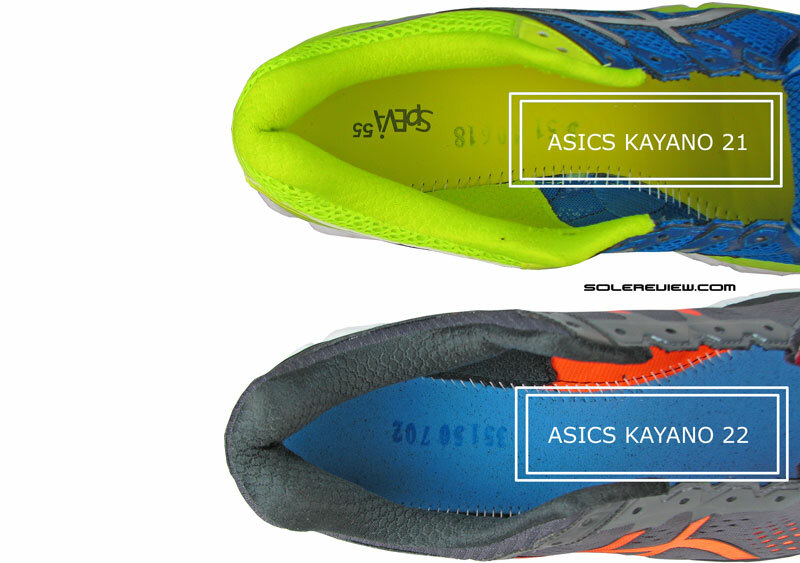 The new Kayano is 5mm longer than the K-21, and that has to influence transition behavior. 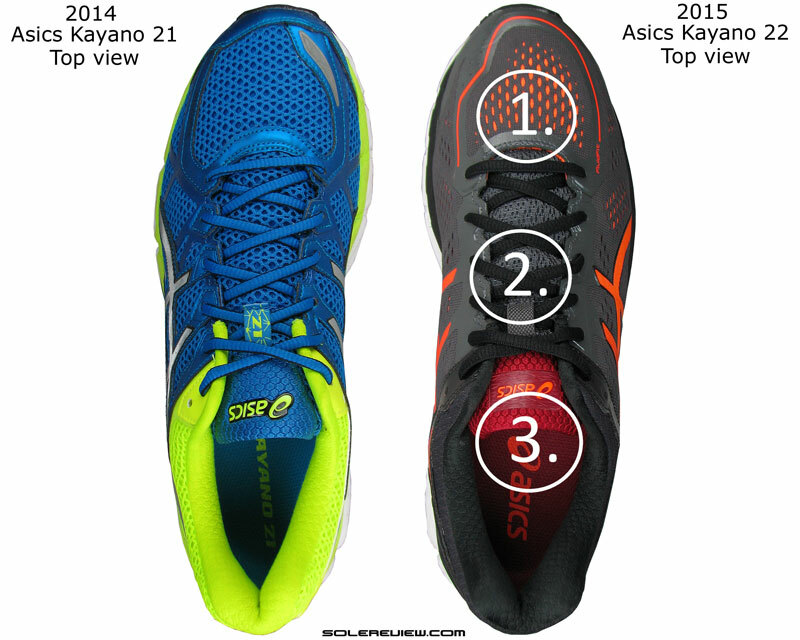 In comparison, the last year’s Kayano 21 felt more compact and nimble. 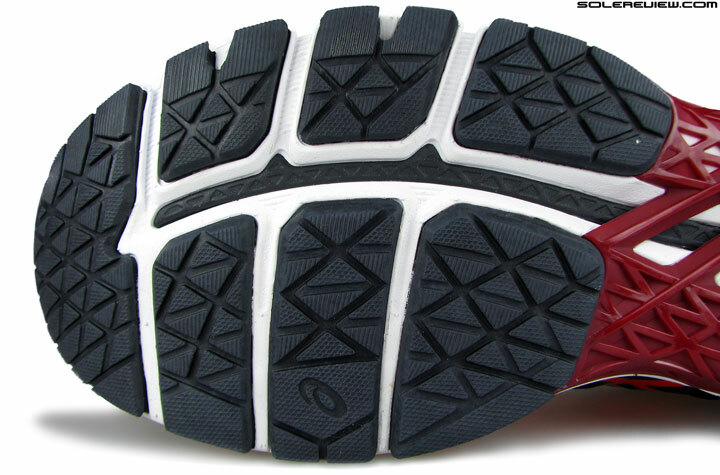 The rubber lugs under the forefoot transmits pressure through the now softened midsole. Another side effect of the softness overload is how the foot feels even after a simple 7 miler in the Kayano 22. The corners of the forefoot outsole lugs tend to transmit pressure through the midsole, resulting in a dull ache under the ball of the foot. This is similar to what goes down on the Cumulus. So unless you’re very light, you might want to consider doing your longer runs in something else than the new Kayano. And the shaky rearfoot makes one feel like you’re running on a cambered road, with the body trying its best to compensate for the shoe’s shortcomings. If it’s stability you want, stay within the safer confines of the 2014 Kayano 21. If you wanted your Kayano to be softer at the cost of stability, or simply plan to walk around in these shoes, then by all means get the 22. Otherwise, there are far better options to get the job done. Asics has sure dropped the ball on this one. 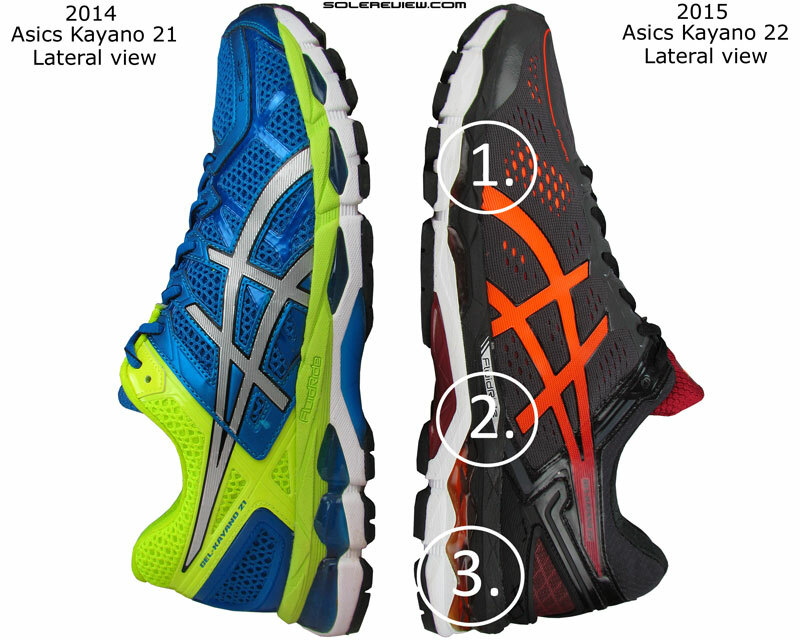 Looking to upgrade your older Gel Kayano 21 to the latest version, but not sure how the 2015 model compares? We can help here. The following infographic is a ready-reckoner for what changes you might expect in the new model vs. old. To make this more fun, we’ve put in a system of percentage match, which calculates a weighted average for a set of attributes. I love your website and find it very useful. Sadly, it only confirms what I have experienced – that in the last 5 years, all of the shoe companies have either removed their stability shoes (Mizuno Nirvana, Brooks Trance) or lowered them, removed the supportive features and/or softened them (NB 1260 iterations, Asics Kayano, Saucony Hurricane). I am sure that things will come full-circle (they’re fashions, they always do), but in the meantime, do you have any recommendations for someone who likes old-school, high-drop, technology-laden support shoes (my favourite-ever shoe was the NB 1226)?? Thanks! Only the Brooks Beast 14, Adrenaline GTS 15 (haven’t tested the 16 yet) and the Nike Zoom Odyssey come to mind. These are pretty much the last bastion of stability shoes as people knew them. The Kayano has ceased to be a stability shoe. Hey, thanks for the picture. It seems that the Kayano 23 has a borrowed quite a few bits from the much hyped Asics Metarun. 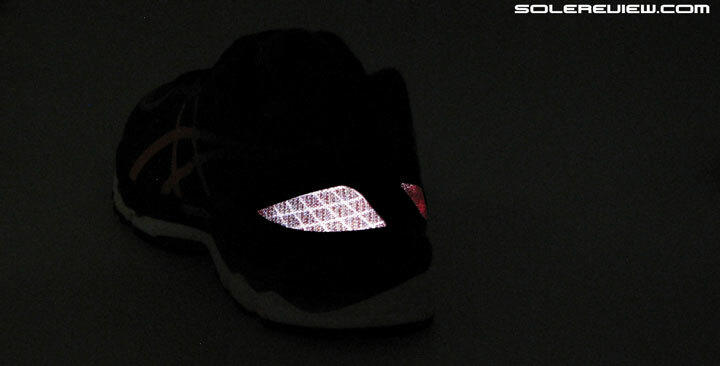 Anyway, Solereview, what do you think about the Metarun (neglecting the factor of shoe cost)? No idea at all. Can’t say till we run in them. Hi Solereview! I have been running in vomero 9 for almost a year now and I have always suffer from some aching sensation on my right foot, notably the plantar fascia ligament (is that how you call it?) area. Strangely only my right foot suffers this symptons and I have only started running after I picked up the vomero. Is it the problem of the shoe? Do you have any recommendation for this kind of symptom? Thanks! It is best that you see a podiatrist or equivalent for a professional opinion. It could be the shoe, or something else. We won’t hazard a guess. As a longtime Kayano wearer, I just ran a hilly marathon over the weekend in my new Kayano 22’s. I bought them a size up because of the narrow toe box, but I assumed the issue was merely with how the sizing was assigned and nothing else. Needless to say, I realized my foot wasn’t being held quite right and ended up finishing with a lot of foot pain, not to mention a lousy time. I did wear them a couple times before the race, but only casually, and as you said, just walking in them felt fantastic. Let the buyer beware! Thank you for sharing your experience. We have a feeling a lot of other Kayano long timers are going to be disappointed too. Seems like most of the major shoe makers have moved toward pointier-toed designs in their primary models. This is just plain counterintuitive to me. What could possibly be driving this design trend? Have absolutely no idea at all. The shoe just looks sleeker with such a design. Maybe it is a case of one brand starting it, and others picking up the bad habit thinking it to be a good one. Thank you for this review! It really sheds a lot of light on why I started getting the dreaded ITB on my long mileage runs (training for the Seattle Marathon). Many times during my long runs I kept feeling I was not getting the stability I got from the K21’s. I thought I was imagining it! I bought the Nike Odyssey’s and all is well on my long runs again. The Odyssey’s have incredibly stability, are light, and comfortable on the tail end of my runs. There have been so many good reviews for K22’s and I fell in to the hype. I’m glad to see your review is what I exactly feel about this iteration of the Kayayo’s. You’re welcome. You aren’t imagining any of those niggles, that’s because the K-22 is inherently unstable. The Odyssey is a much better story, agree with that. Sometimes I just think the pre-updated running shoe is better in terms of construction and colour, so I buy the pre-updated one instead. I bought kayano 18 instead of 19, vomero 1 instead of 2, cortana instead of cortana 4, and fastwitch 6 instead of 7. I forget to mention about my purchase of NB 1260v2 instead of 1260v3, because I thought stabilicore is NB’s patented technology. 1260v2 was the last shoe in the 1260 series to feature such technology, since v3 adopted conventional dual-density medial post instead, of which I was not fond at. With the shallower toe-box I am now wondering if my usual size (UK 10) will even fit me anymore 🙁 Tried on a pair of the new GT2000-4 (beautiful looking in black) at a local store here in Dublin last week and they felt a bit tight. Maybe it was my imagination after reading this review, maybe the thick socks I was wearing…not sure. Are Asics moving forwards, or going backwards? The new Metarun looks interesting. 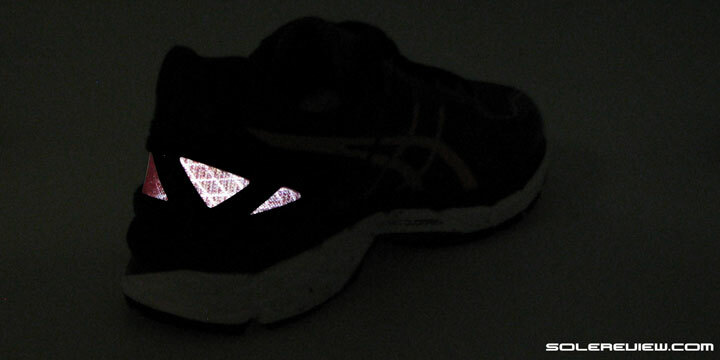 Companies like Nike and Adidas genuinely seem to be innovating, evolving….Asics seems to be getting worse?? Asics is caught in a design inertia – which can work for, or against them. With all the other brands moving forward in construction and fit, Asics sticks to the same old format. Which might actually cater to a certain population who prefers the traditional running shoe – it is just that Asics would need to manage its expectations. I just ran in new kayano 22’s and the toe box is stiff and pressure on balls of feet….i only went three miles! I LOVED my 19’s and kept buying them but couldn’t find any online! I bought 20’s and was only fair on that. Never tried 21’s. Switching brands might be a good idea. Right now, the best motion control shoe is the Zoom Odyssey. Great review, but what a disappointment. It seems they are destroying the Kayano little by little. I wonder if you will ever review the Quantum 360. Also, just for fun, what do you think about those new Enko shoes with shock absorption? Happy New Year! Asics is doing some really strange things to many of their shoes. Yes, the Quantum 360 review is likely. Not sure of Enko, but we’re not impressed – they are late to the party. The comments thread will be closed till January 17, 2016. Any inconvenience is regretted. Premium access members can continue to use their dedicated comment section, which will be open. I have always been happy with the balance of support and responsiveness of the Asics Noosa series. My latest version is the 10, and after a month of training on 90% pavement, my post tibial tendon is starting to ache. So I sought a more stable option in Asics’ line up. Had just ordered the Kayano 22 before stumbling onto this review. Now I’m afraid to give em a try. Do you know how these compare to the Noosa in terms of stability? I’m trying to decide whether to search for a Kayano 20/21 or take up on your recommendation of the Zoom Oddysey. Also planning to increase my mileage, so I am willing to try a little more cushion. Have no idea about how they feel vs. the Noosa, sorry. Don’t have any miles on the Tri -Noosa. Hello, I always happy to read your reviews. From your reviews, I get to knew many brands and kinds of shoes. Asics and Brooks are both my favorite brands. Due to my ACL injury last time, I choose the Brooks Adrenaline GTS 14 based on your review to have the support I need for my post ACL training. The shoe is just suit me and thus very thanks for your reviews. But now I want to have another pair of shoe for tempo run. I heard the shop workers around my housing area recommended me the ASICS TartherZeal 3 for the tempo run but I cant find any review of the shoe in your page. Will you make a review on that shoe soon? Or is there any other shoe that will be suit for me? I am 175cm tall and weighted 54kg. The shoe I having for training now is ASICS Nimbus 17 and Brooks Adrenaline GTS 14. Hello You Ming, thank you for the feedback – happy we would be of some help! 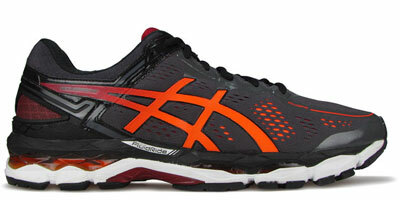 We have not reviewed the Asics Gel Tartherzeal 3 and currently have no plans to do so. 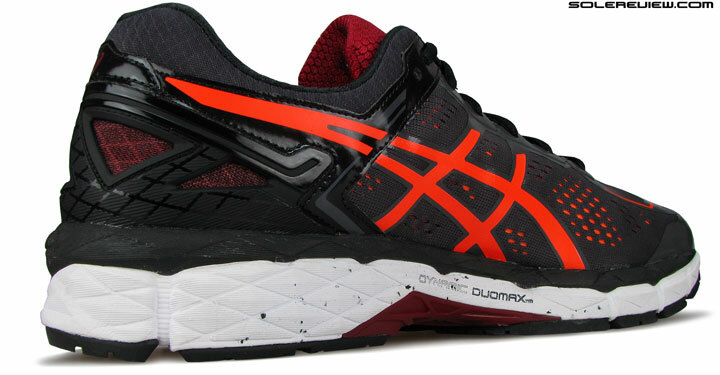 But we have heard good things about the Asics DS trainer so that’s a shoe you can try for tempo workouts. Among other brands, you can try the adidas Tempo or Boston Boost, the New Balance 1500 and Nike LunarTempo or Lunaracer 3. Wow, this review is a sad confirmation of what I am experiencing. I have worn Kayanos since the first model was introduced. Some models suited me better than others. Over the past few months, I have almost reached the point of not being able to run. Everything hurts from my lower back down! I finally paid attention to how my feet were striking the ground, and my feet are all over the place in the 21s. Out of desperation, I pulled out a very old pair of 2150s that I bought to use for activities other than running. After 2 weeks, my aches and pains are almost gone. Based on your review, I’m afraid the 22s will be even worse for me than the 21s…. I guess I will have to try another brand. Thank you for the in-depth analysis! Appreciate the detailed feedback – you could give the Brooks Adrenaline GTS 16 a look. Thanks, I ordered a pair of Adrenaline 15s (because they were cheaper of course) and a pair of Nike Zoom Odyssey. I’m desperate for sure! My training for an April marathon is way off course. Thanks again for your help and great reviews.